LOS ANGELES (July 2, 2015) – California’s citrus industry is threatened by the Asian citrus psyllid (ACP), a tiny pest that can transmit the world’s deadliest citrus disease, Huanglongbing (HLB). Currently, all of Los Angeles County is under quarantine for the psyllid, which continues to spread across the state. Along with Bayer CropScience and California Citrus Mutual, City Councilmember Gil Cedillo announced TODAY, July 2 that, “Citrus Matters” to Los Angeles. During the event, commercial citrus growers from the region were recognized for their contributions to the state of California and acknowledged the devastating disease that could destroy the state’s citrus industry. 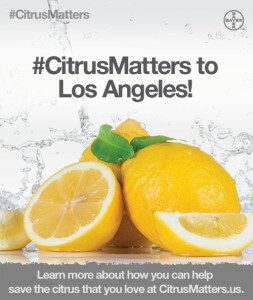 The announcement also serves to highlight the role Los Angeles residents must play in protecting California’s $2.4 billion commercial citrus industry through the #CitrusMatters initiative. To date, the psyllid has reached 15 counties throughout Southern California; however, HLB has been recorded in only one tree in California – a lemon/pummelo tree found on residential property in the Hacienda Heights neighborhood of Los Angeles in 2012. For every Californian who cares about citrus, that tree, which has since been removed and destroyed, serves as a warning that all citrus trees are at risk of being affected, from the trees that decorate their neighborhood to the commercial groves nearby. Spreading the word and increasing awareness about the disease, the ACP and why they love citrus, using the hashtag #CitrusMatters. Through each use of the hashtag (now through September 30), Bayer CropScience will contribute $1, up to $25,000, to advance existing and future research to find a solution to HLB in California. Visiting CaliforniaCitrusThreat.org to access HLB and ACP resources specific to Los Angeles County. Monitoring their trees, contacting the California Department of Food and Agriculture (CDFA) Exotic Pest Hotline at 1-800-491-1899 if they think they’ve spotted an infestation and having their trees checked. The citrus industry has a storied history in Los Angeles. Southern California’s first orange grove was planted at San Gabriel Mission in 1804, and the state’s very first commercial citrus operation was established in what is now downtown Los Angeles. The #CitrusMatters initiative is part of the ongoing effort by Bayer CropScience to provide citrus growers across the nation with solutions to help combat ACP and HLB. To learn more about the #CitrusMatters initiative and how homeowners, commercial citrus growers and citrus lovers alike can help save citrus, visit CitrusMatters.us. For more information on Bayer CropScience’s citrus portfolio, please visit: https://www.bayercropscience.us/crops/citrus! Bayer CropScience is committed to bringing new technology and solutions for agriculture and non-agricultural uses. For questions concerning the availability and use of products, contact a local Bayer CropScience representative, or visit Bayer CropScience online at www.bayercropscience.us. Visit the Bayer Connect - Social Hub for all Bayer CropScience social media, recent news, blog posts, videos and more. Bayer is a global enterprise with core competencies in the fields of health care, agriculture and high-tech materials. Bayer CropScience, the subgroup of Bayer AG responsible for the agricultural business, has annual sales of EUR 9,494 million (2014) and is one of the world’s leading innovative crop science companies in the areas of seeds, crop protection and non-agricultural pest control. The company offers an outstanding range of products including high value seeds, innovative crop protection solutions based on chemical and biological modes of action as well as an extensive service backup for modern, sustainable agriculture. In the area of non-agricultural applications, Bayer CropScience has a broad portfolio of products and services to control pests from home and garden to forestry applications. The company has a global workforce of 23,100 and is represented in more than 120 countries. This and further news is available at: www.press.bayercropscience.com. California Citrus Mutual (CCM) is a citrus producer's trade association whose 2,200 grower members comprise 60 percent of California's 275,000 acre, $2.4 billion citrus industry. The Exeter, California-based organization was founded in 1977 by those who felt the need to unite their fellow growers into a cohesive, powerful force. Throughout the years, CCM has brought to fruition many of the goals of the founding fathers and has developed into a dominant force from within as well as outside the industry. Having attained the privilege to be called the "voice of the citrus grower," CCM remains the vessel which successfully navigates the often rocky waters of the business interest of its membership. For more information on CCM, visit www.cacitrusmutual.com.